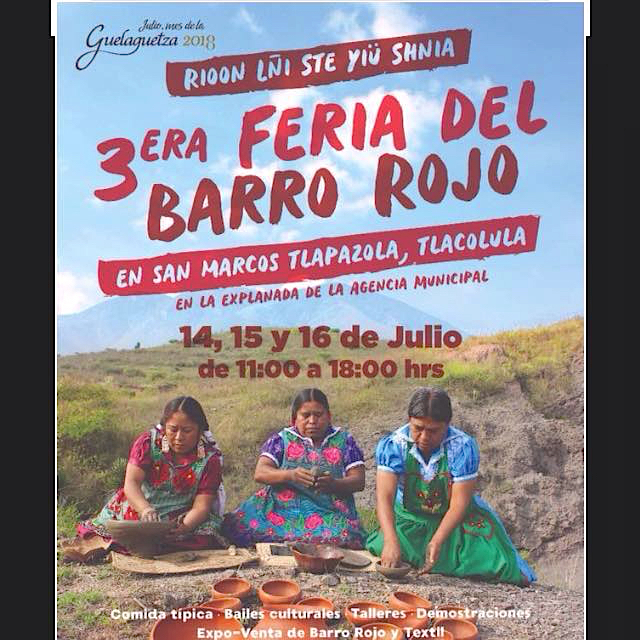 Who wants to join me for lunch in San Marcos Tlapazola tomorrow, Saturday, July 14? 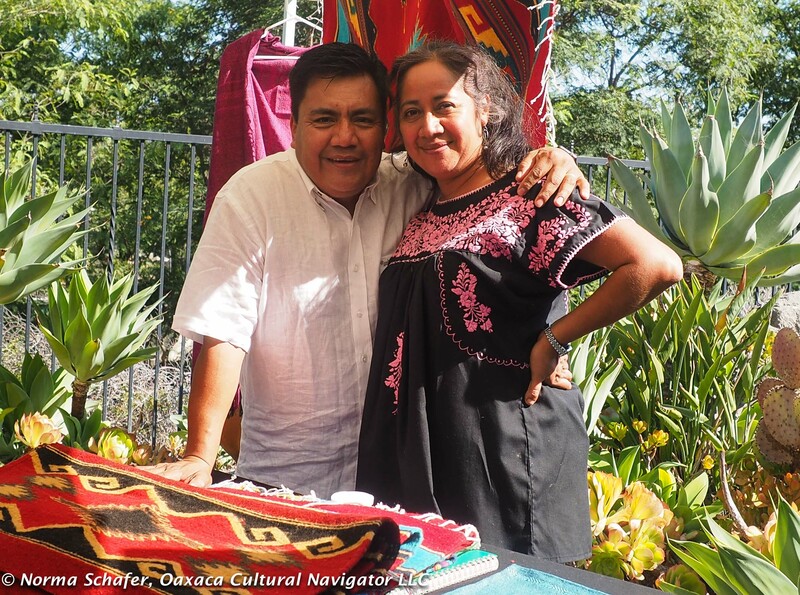 I’ll be there by 11 a.m. in time to see Lila Downs, the madrina (patron) of the celebration, cut the ribbon for the official opening. This is the third year of the festival and each year it grows bigger. 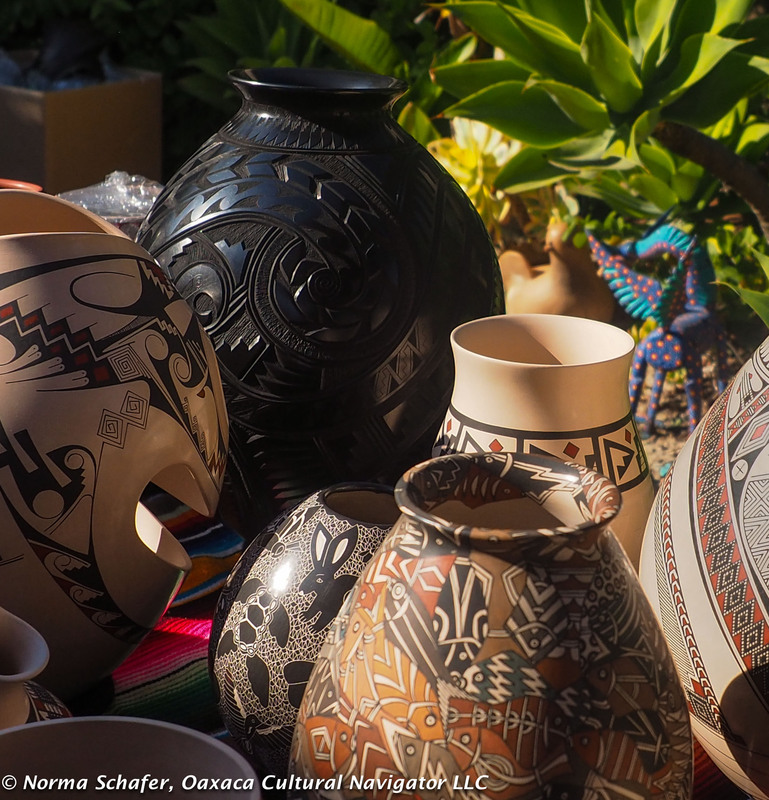 In addition to selling the specialty ceramics of the village — the beautiful red clay dinnerware and accessories — you can dance, eat, take photos, drink atole and mezcal, buy aprons, and just overall enjoy the festivities. 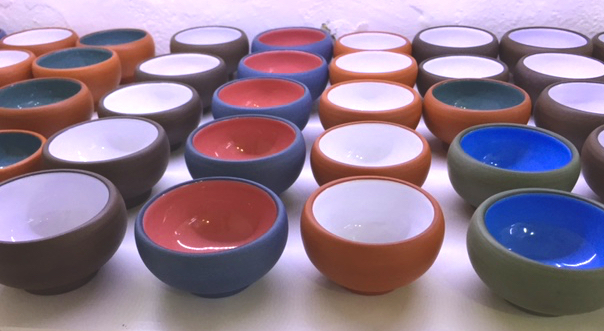 My own Teotitlan del Valle kitchen has a shelf of red clay dinnerware made by Macrina Mateo Martinez, one of the more famous artisans. 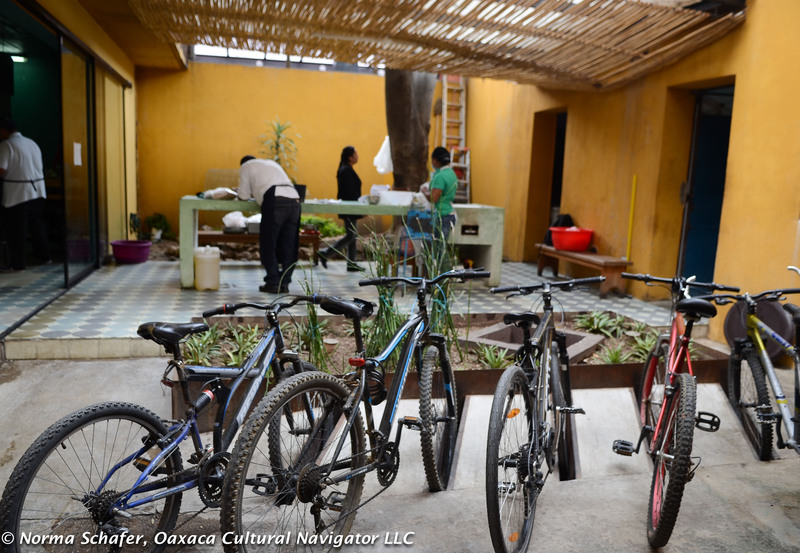 San Marcos is located in the hills about 20 minutes above Tlacolula. You could combine this with a visit to the Sunday market, too. I took the photos below in 2015, the year I separated from my wasband, still deciding how I would spell my new last name which is a derivative of my mother’s maiden name (in case you were wondering why the names don’t match!). 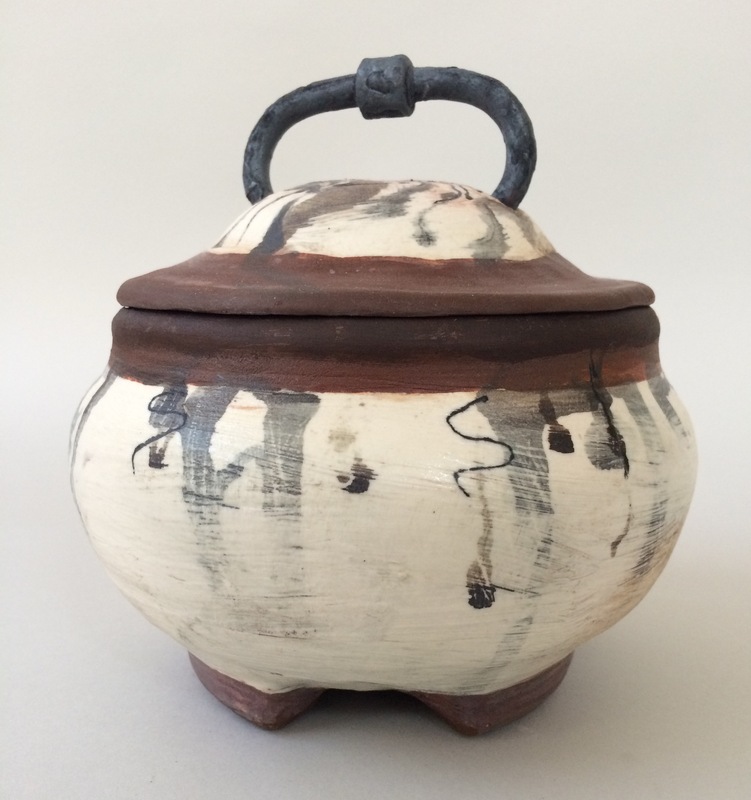 Carol Beron is a ceramic artist who takes her inspiration from much in Oaxaca, from carved animal figures to pre-Hispanic indigenous organic forms. 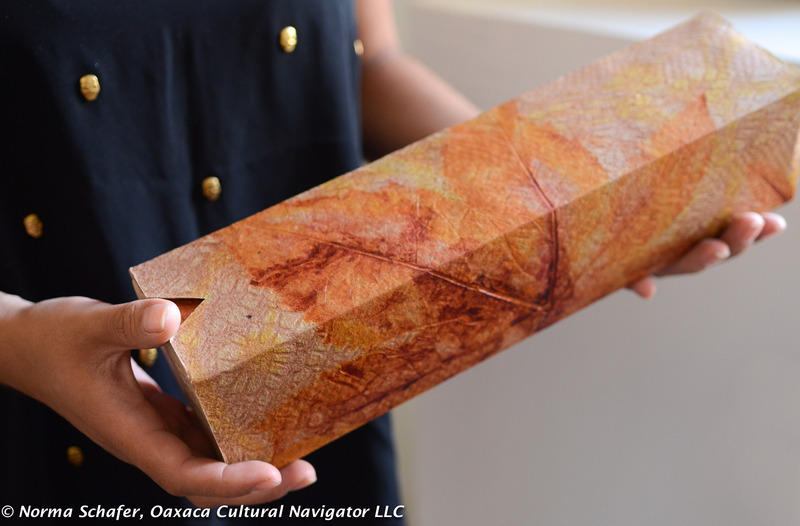 She lives in New York City and visits Oaxaca often. At ARIPO Opening reception: Friday, September 30, 4 to 7 p.m.
Exhibition and sale until October 15, 2016. ARIPO is open Monday through Friday, 9 a.m. to 7 pm., and 11 a.m. to 3 p.m. on Saturday. 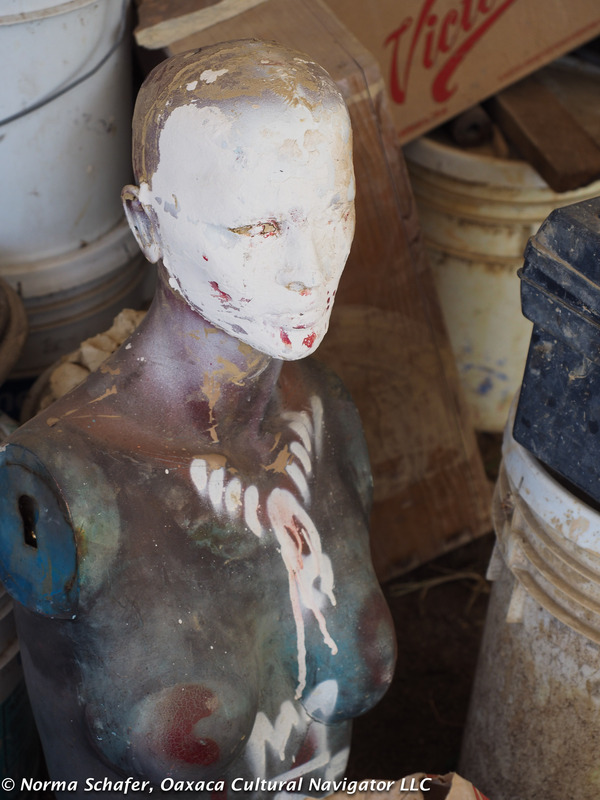 All pieces are for sale and can be picked up on October 15 at ARIPO. 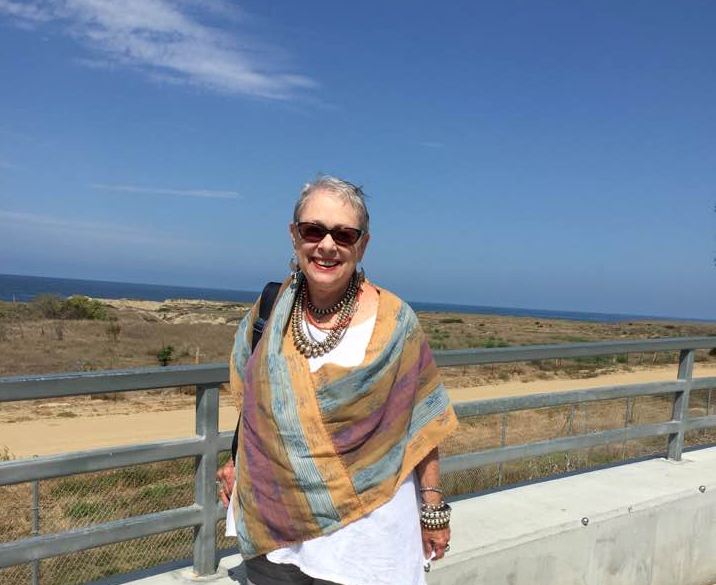 As I drive south from my son’s home in Huntington Beach, California, on my way to visit Barbara and David, and dear friend Merry Foss in San Diego, I marvel at how the landscape looks like Mexico, how the climate feels like Mexico. Except there is development everywhere, new houses, shopping centers, freeway congestion. Infrastructure. When I stop at the Pacific Ocean overlook, everyone around me speaks Spanish and I take up a conversation with a young mother traveling with two daughters from El Paso, Tejas (the J is a soft H. Tay-Hass). Oh, you might think that could be Texas. Sometimes I think we are borrowing the Southwest from Mexico and the day of reckoning will come when most of us will speak Spanish and justice will prevail. At Barbara and David’s house, I expect a small gathering. 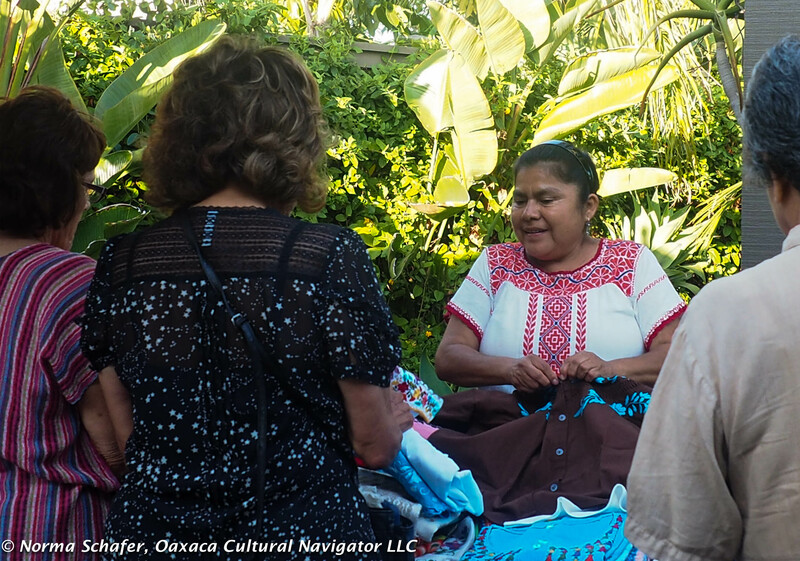 I know my Teotitlan del Valle friend Merry Foss will be there with exquisite beaded blouses from the State of Puebla Sierra Norte made by a cooperative of indigenous women that Merry started six years ago. Then, I turn the corner. Que Supresa! Que Milagro! I see part of my extended family from Teotitlan del Valle and Oaxaca. I had no idea that Pedro Mendoza and his wife Carina Santiago and their son Diego would also be there with their terrific handmade rugs. Carina runs Tierra Antigua Restaurant and Pedro is a weaver/exporter. 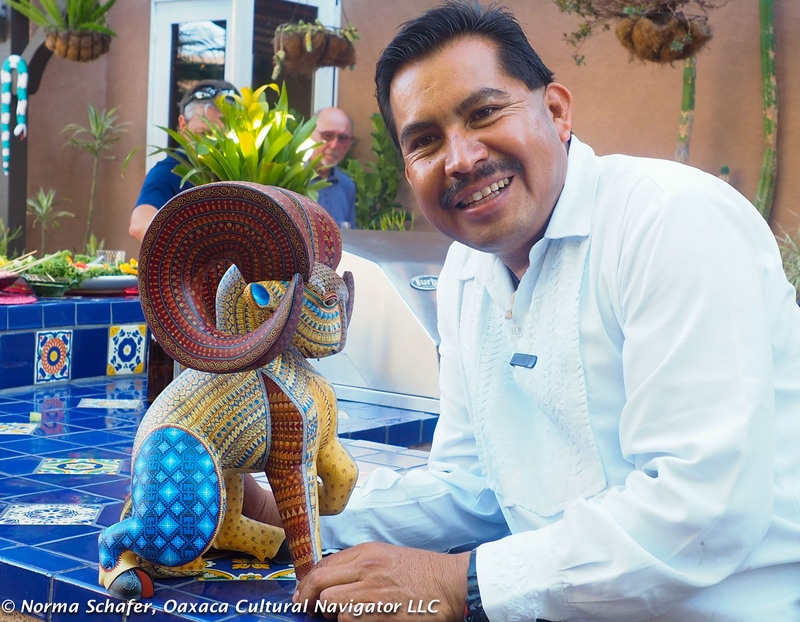 Or, that friend Jacobo Angeles drove a truck up from Oaxaca filled with alebrijes made by him and family members in San Martin Tilcajete, in Oaxaca’s Ocotlan valley. 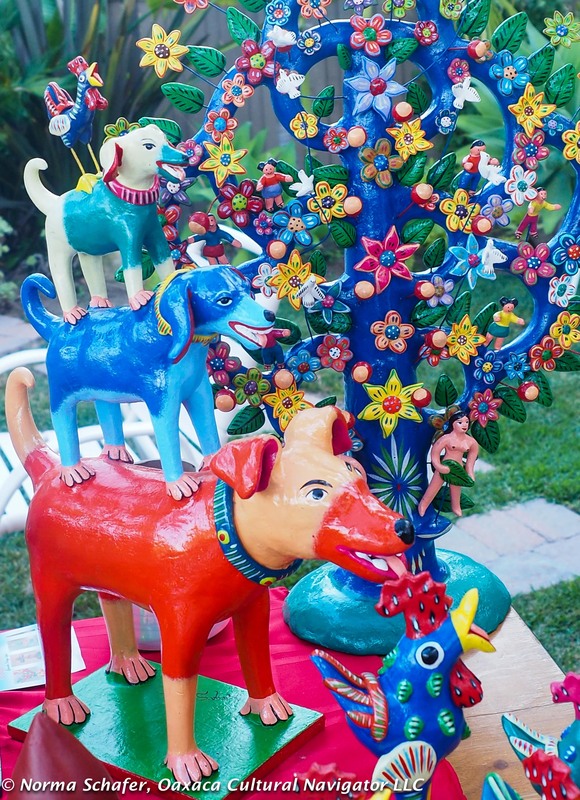 And, then there are ceramics from Mata Ortiz, and hand-carved whimsical wood figures by Gerardo Ortega Lopez from Tonala, Jalisco. 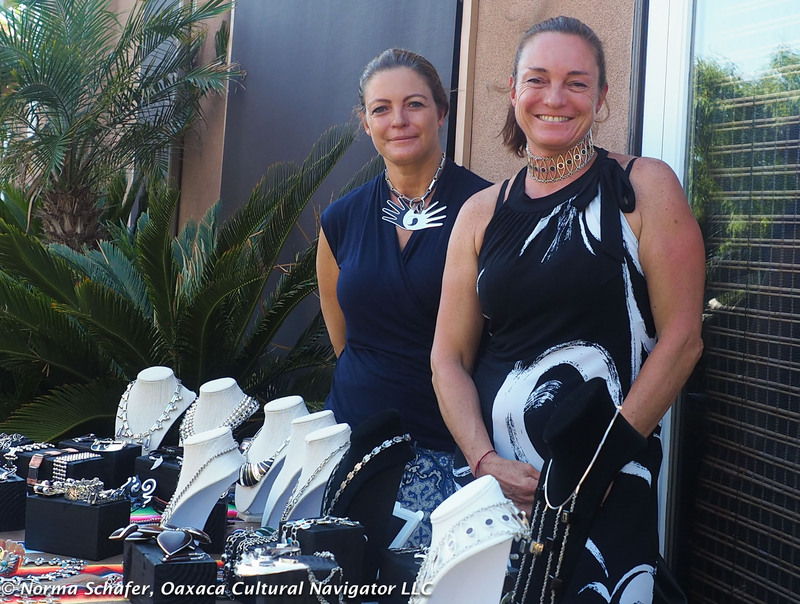 If you can get to San Diego this weekend, there’s a great Expoventa (show and sale) at Bazaar del Mundo, where you can meet all these artisans and buy directly from them. Both Pedro and Jacobo tell me that tourism has dropped substantially in Oaxaca in the last month our of fear about the clashes between the federal government and the striking teachers. 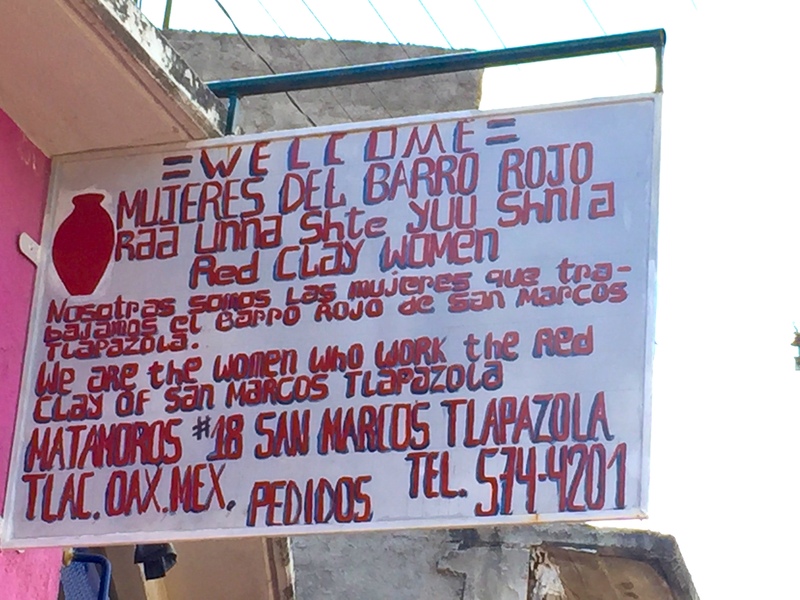 While Oaxaca’s economy depends on tourism, the teachers have legitimate grievances that need to be addressed. It’s complicated! 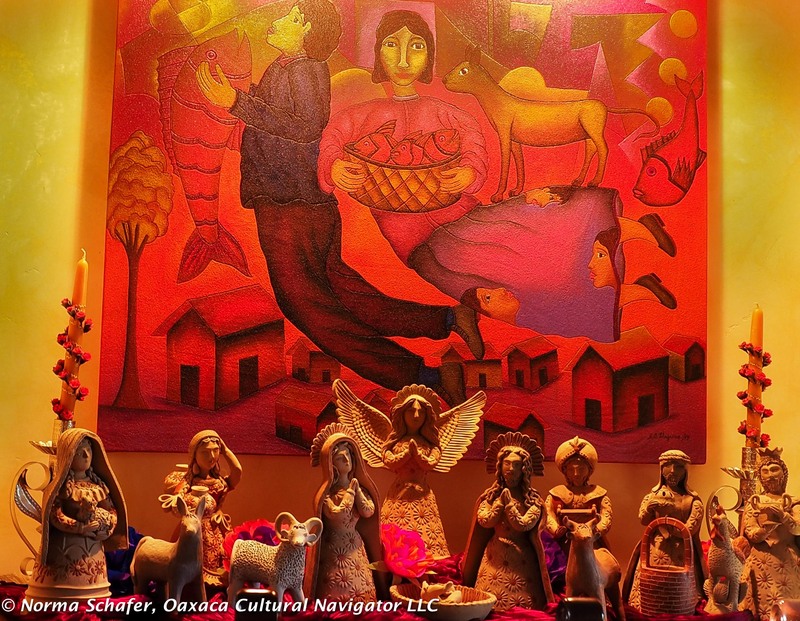 Some artisans who have visas and have come to the U.S. to do business for years, are able to cross the border and try to make up for what is lost in the local economy. Instead of talking about building walls, United States leaders need to talk about building bridges. 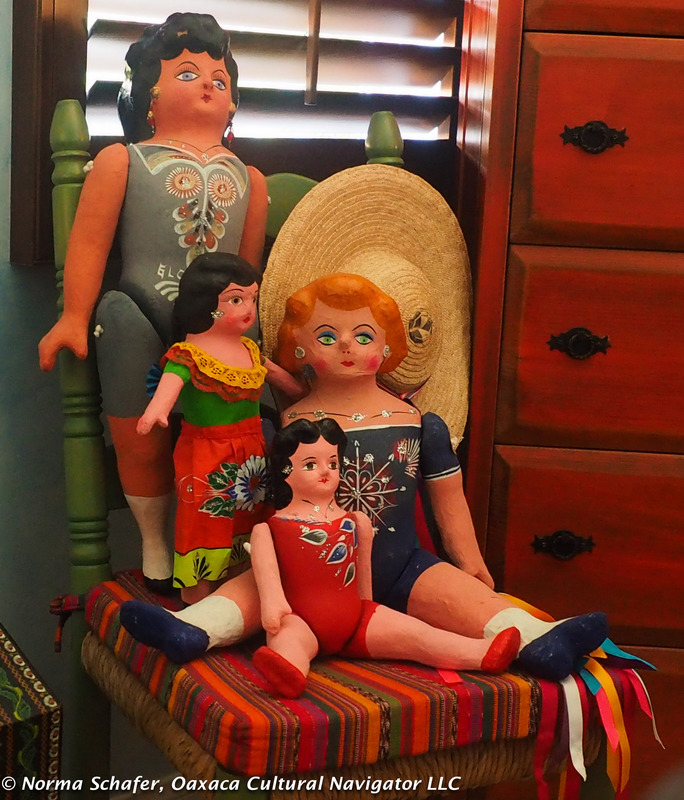 In the meantime, it takes people like David and Barbara, Robin and Linda, and members of Los Amigos del Arte Popular de Mexico who keep the folk art traditions of Mexico in the forefront, who host artisans for private sales, who promote that Mexico has a rich artistic and cultural heritage that remains vibrant only through support and understanding. 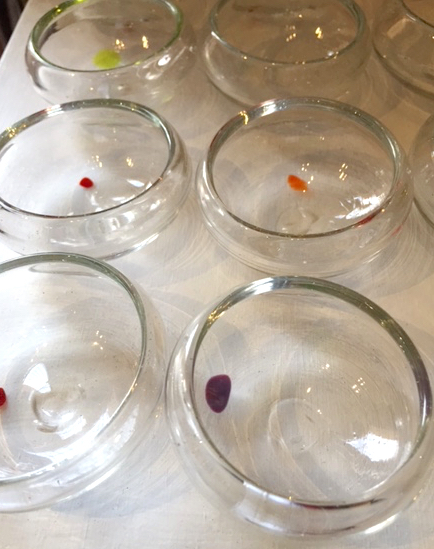 If you personally or an organization you are involved with would like to host an artisan visit to the United States, please contact me. I can facilitate. 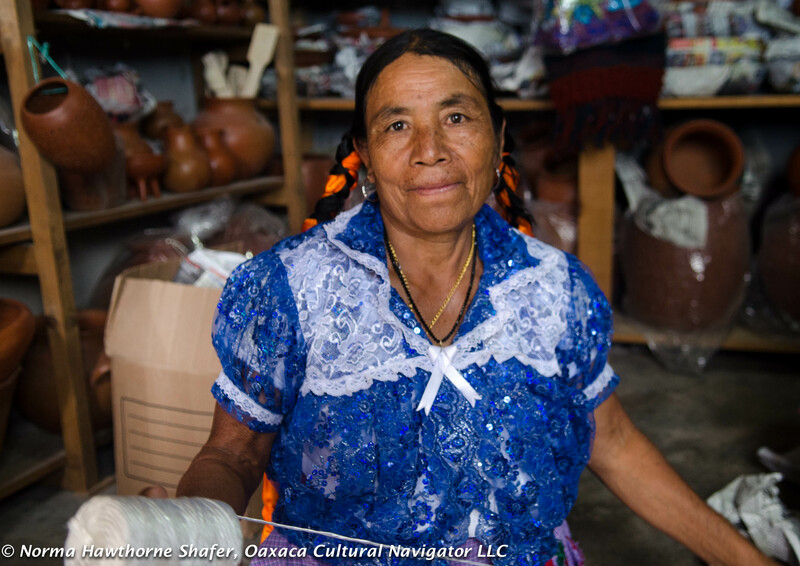 This means a lot to people to keep their family traditions alive and income flowing. 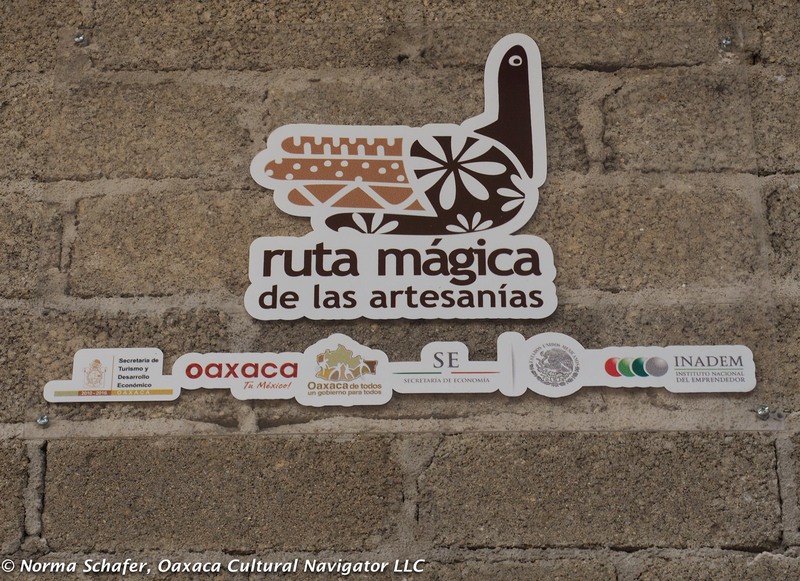 I’m returning to Oaxaca next week. I’ve been traveling for over a month. This is a great interlude to visit with family and friends. I seem to be happy wherever I am these days! I hope you are contented, too. 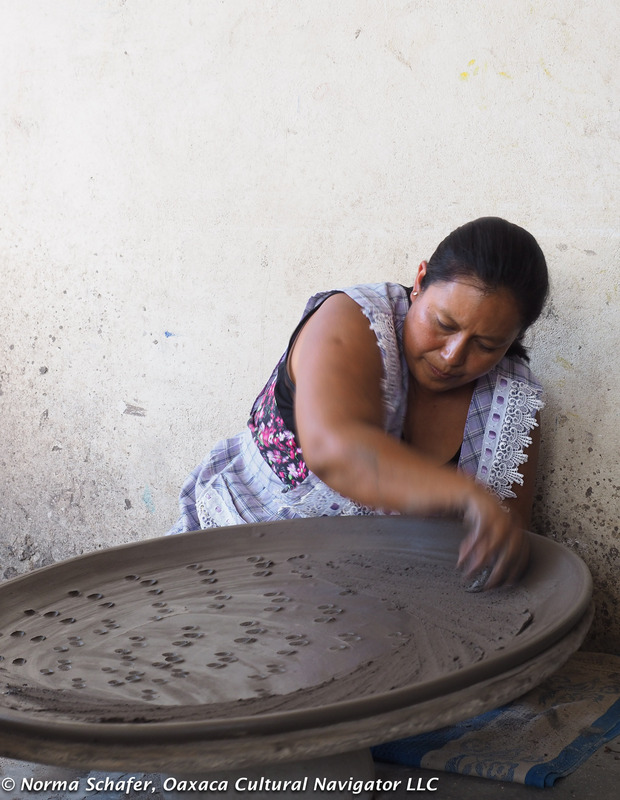 In their own words, Innovando la Tradicion is a creative platform where artisans, designers and artists share skills, knowledge and stories to rethink and honor the ceramic traditions of Oaxaca. 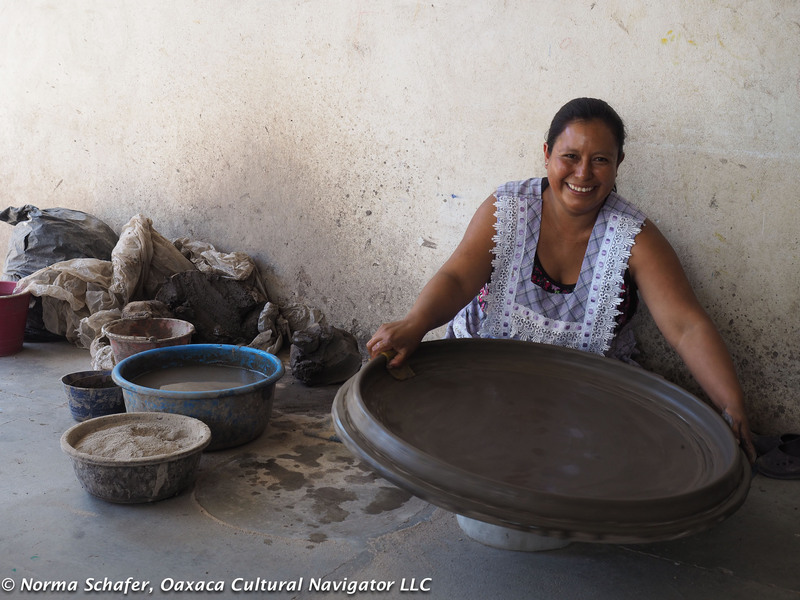 The group helps potters and pottery communities in Oaxaca with support to develop their trade. 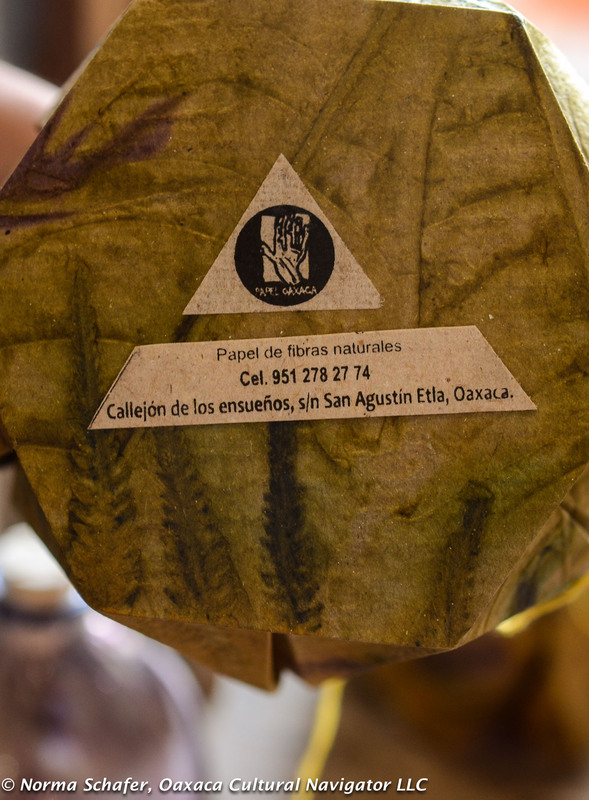 Before the new year, my sister and I joined a one-day excursion to Santa Maria Atzompa sponsored by Innovando la Tradicion and hosted by Gregorio Desgarennes Garzón who everyone calls Goyo. 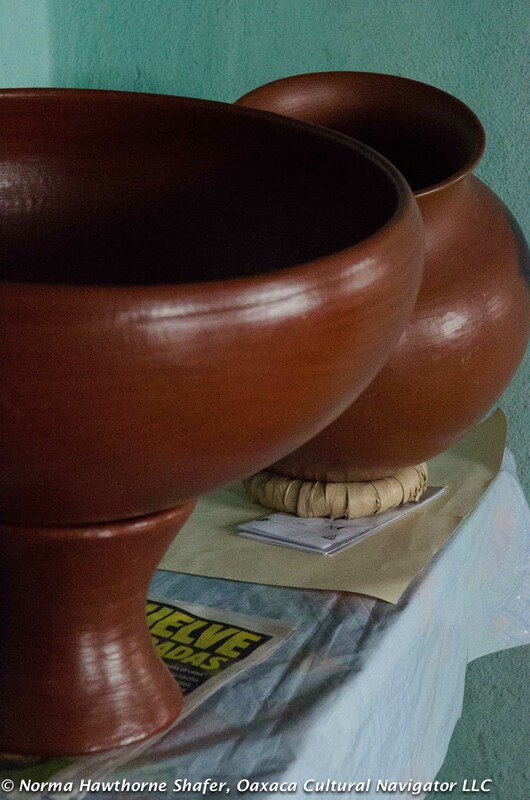 The idea was to spend time with a local family, part of the Innovando la Tradicion collective, and learn how they work with clay to make functional and decorative pieces. This was not a shopping trip. 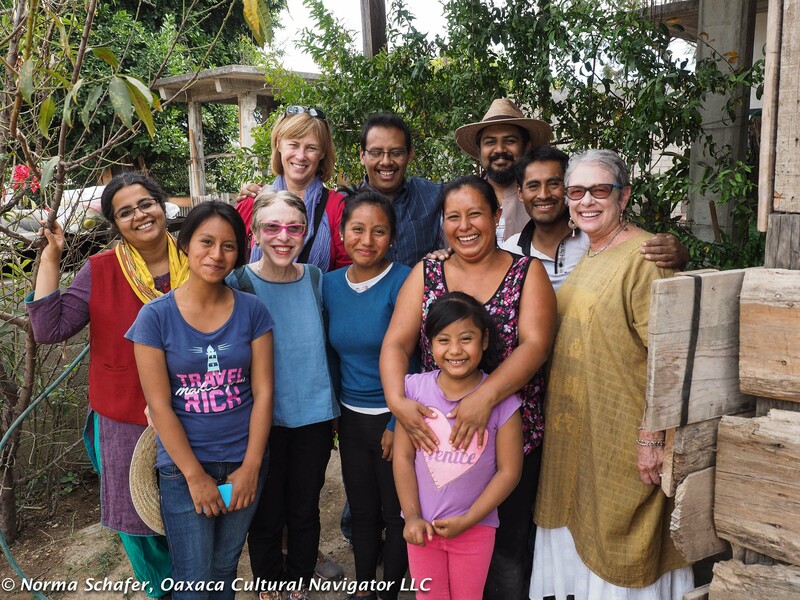 It was a meaningful educational and cultural experience to go deeper into Oaxaca’s indigenous traditions. 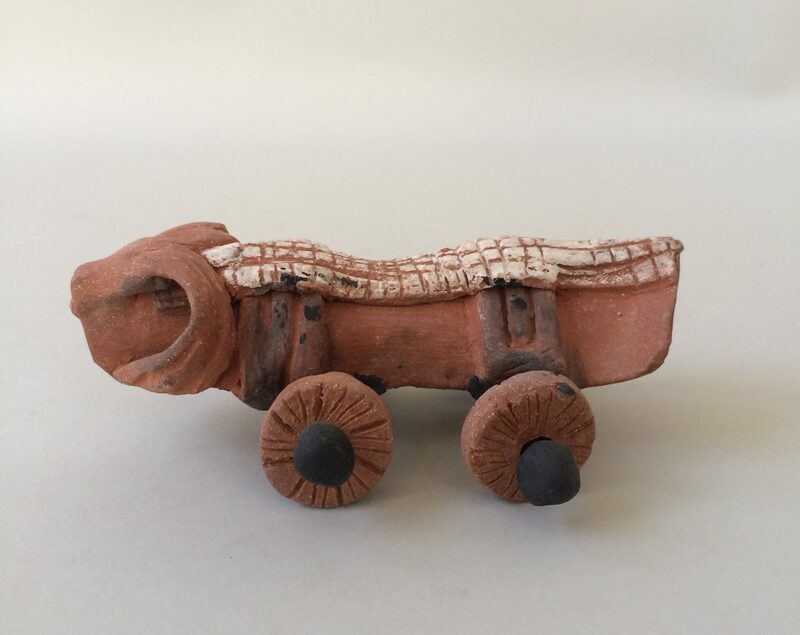 In Atzompa, craftsmen have worked in clay for centuries. They shaped religious articles, storage and cooking vessels for the Monte Alban ruling class, long before the Spanish conquest. 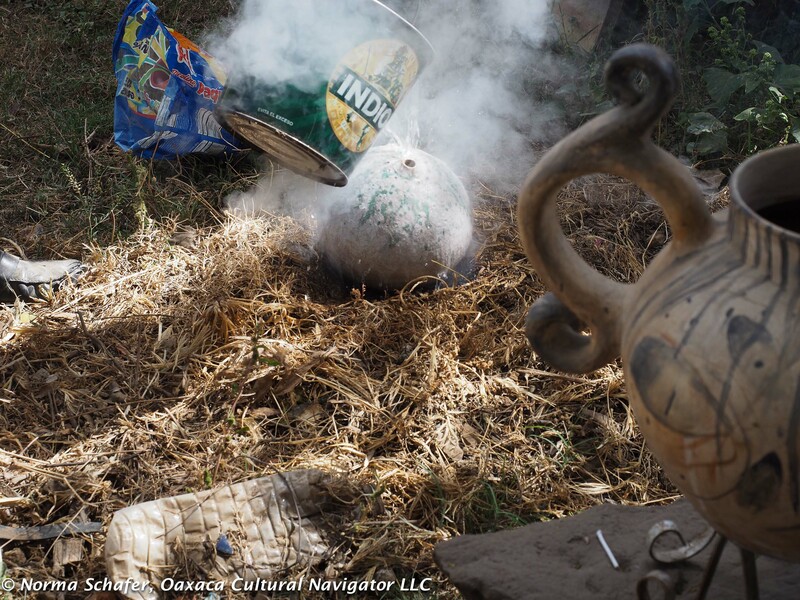 These same traditions continue today with some modification of the ancient technologies. In addition to firing the wood kiln, there is also a modern propane oven for cooking clay at higher temperatures. 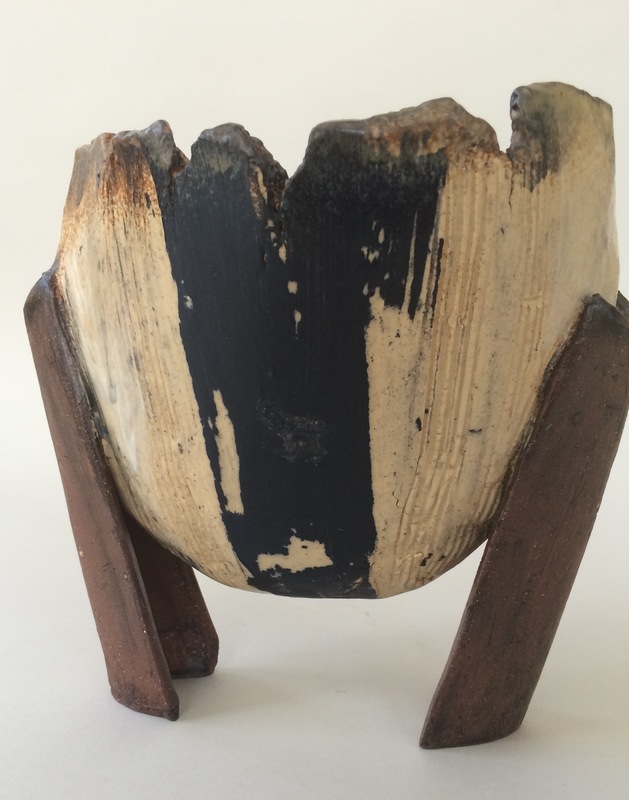 Traditional shapes take form alongside innovative contemporary sculpture. 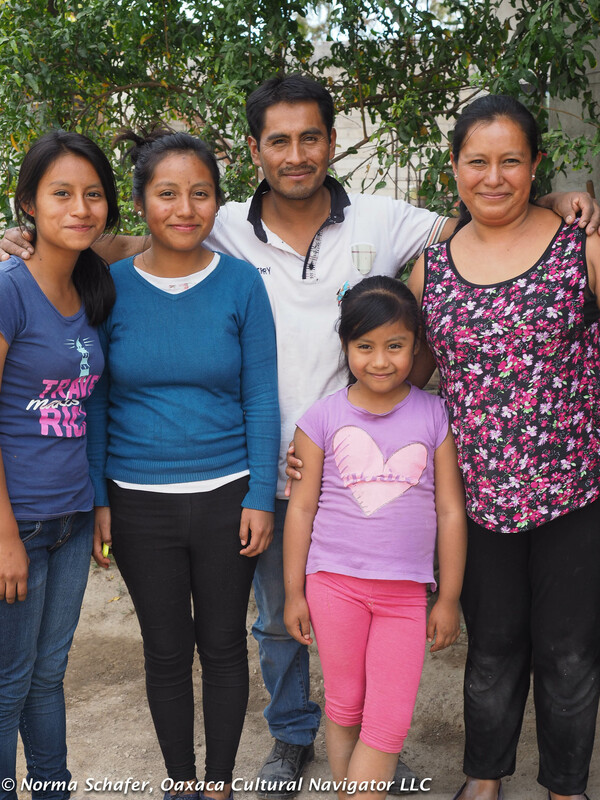 Our multi-national group spent the day with Francisca, her husband Guillermo and their three daughters Karina, Vianney and Maité. Clay has always been in my family, say the couple. We added our impressions: It is the material of possibility, the smell of the earth, it evokes chocolate, bread, eating, family and nature. 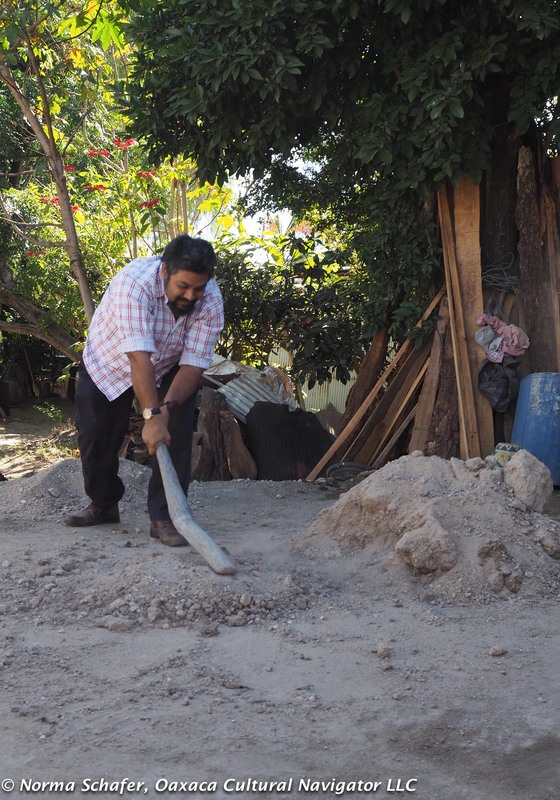 Guillermo took us into the yard first to demonstrate how the large clay chunks are broken up with a mallet made from a hardwood tree limb. 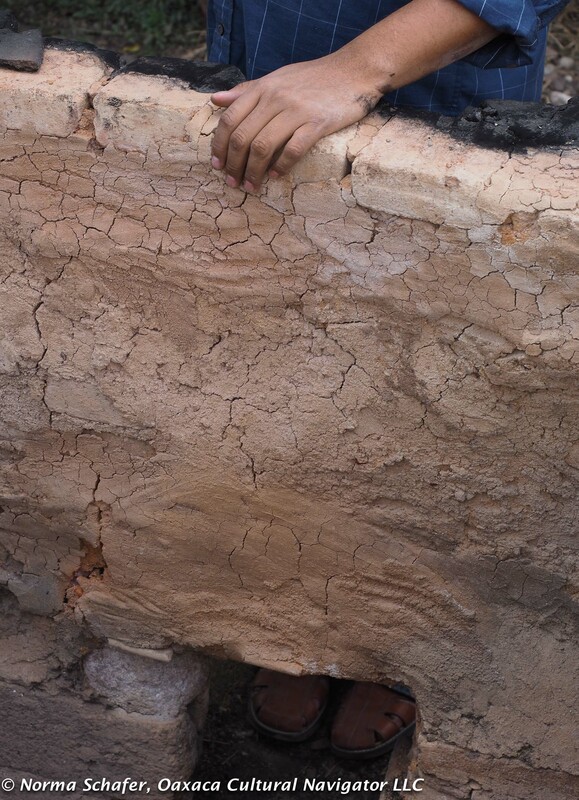 He digs the clay himself from a pit not far from the village center. Some of us volunteered to give it a try and didn’t last too long. 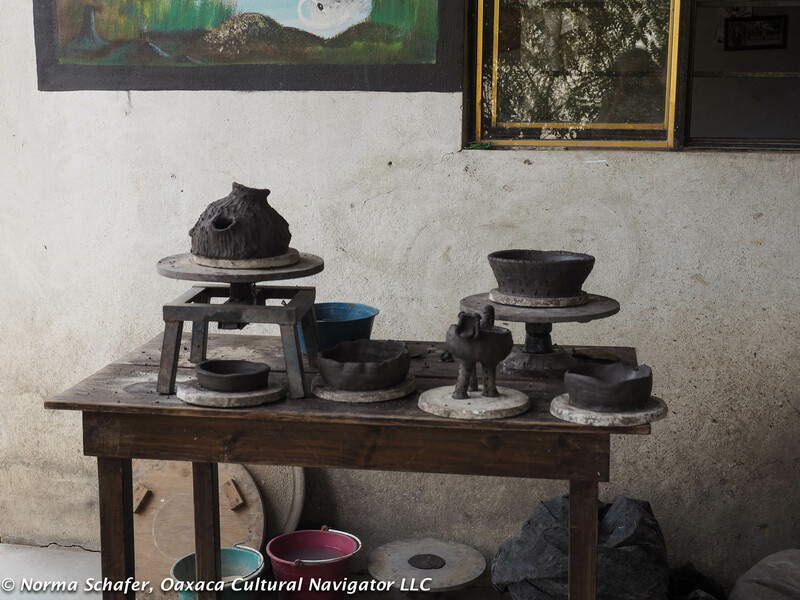 After the clay is pulverized to a fine powder and put through a sieve, it is mixed with black clay that comes from the bottom of a nearby lake. This gives it strength and elasticity. It is Guillermo who does all the heavy prep work. How do you know when it’s ready? someone in the group asks. We can tell by touching it, was the answer. There is no written recipe. 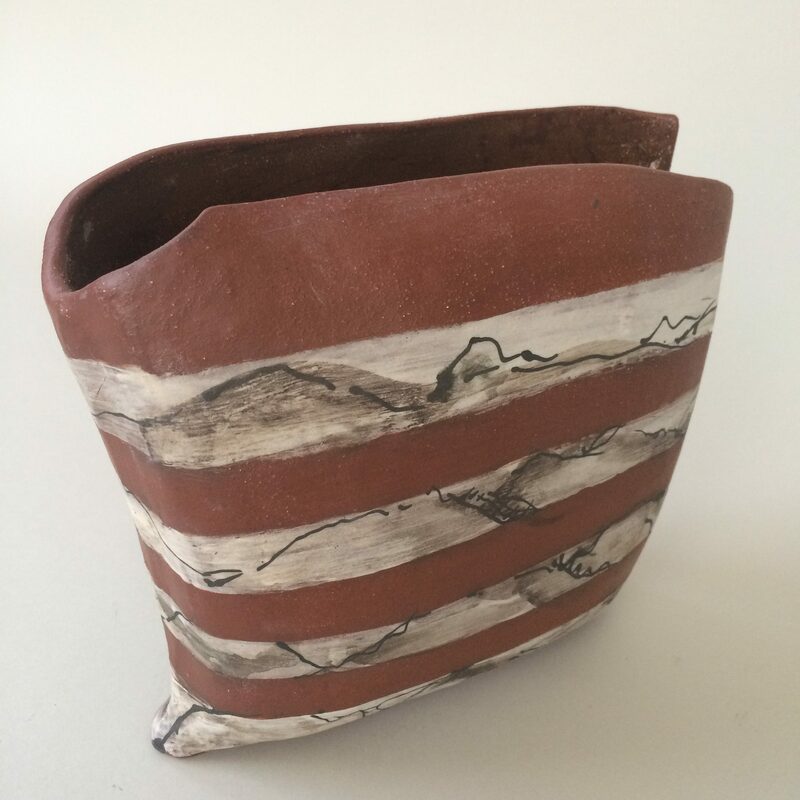 My sister and I loved watching all this because our dad was a potter in Los Angeles and the entire process reminded us of our growing up years, watching dad knead the clay, then work it on the wheel into functional and whimsical objects of beauty. Just as we did, the children here play with clay when they are young, forming simple shapes made with the coil or pinch pot method. 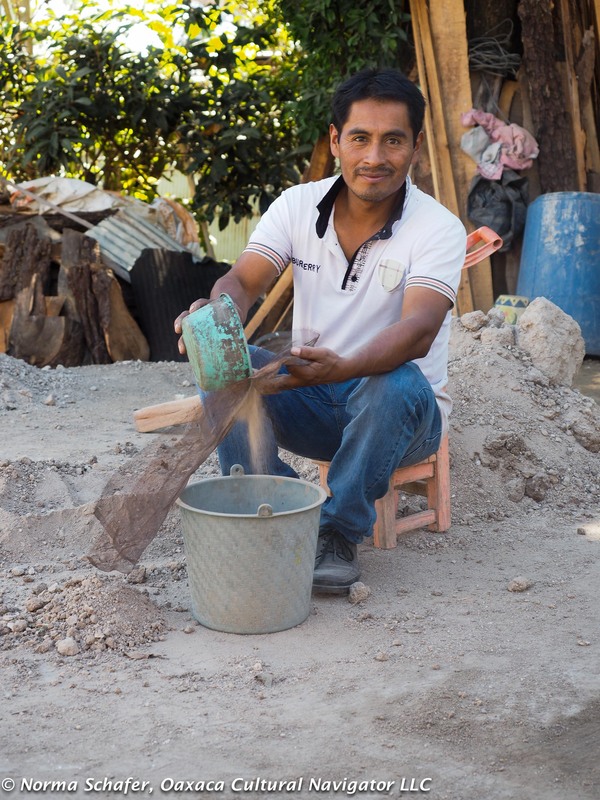 Each day, Guillermo prepares a batch of clay that Francisca will make into comals for sale to clients or at the local market. They make only enough for that day. 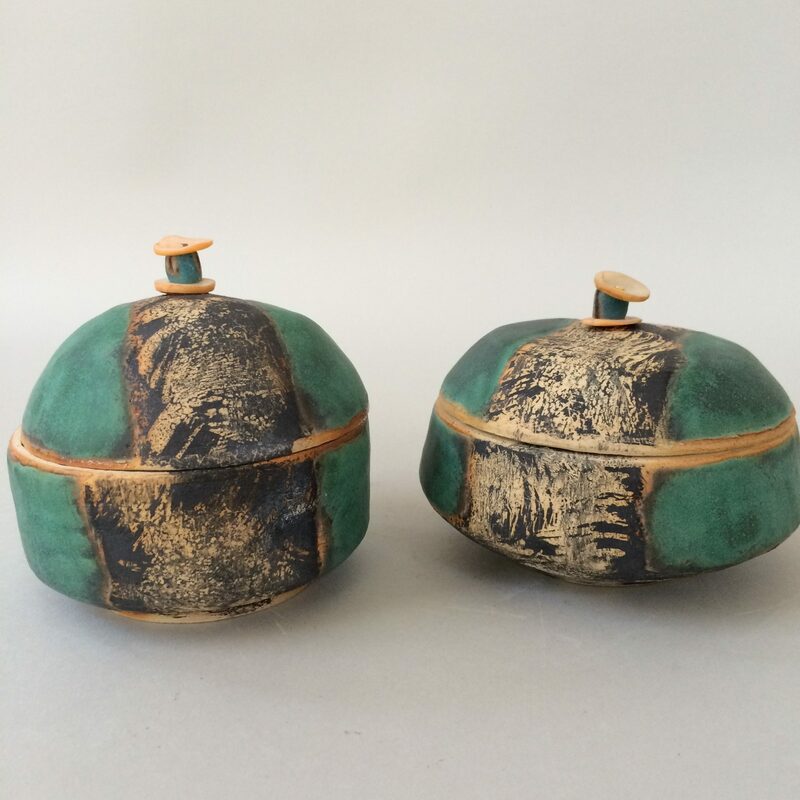 Francisca is known for her fine clay comals. Her mold is a 12-year old comal that is the correct diameter and thickness. She will make about eight comals in a day. 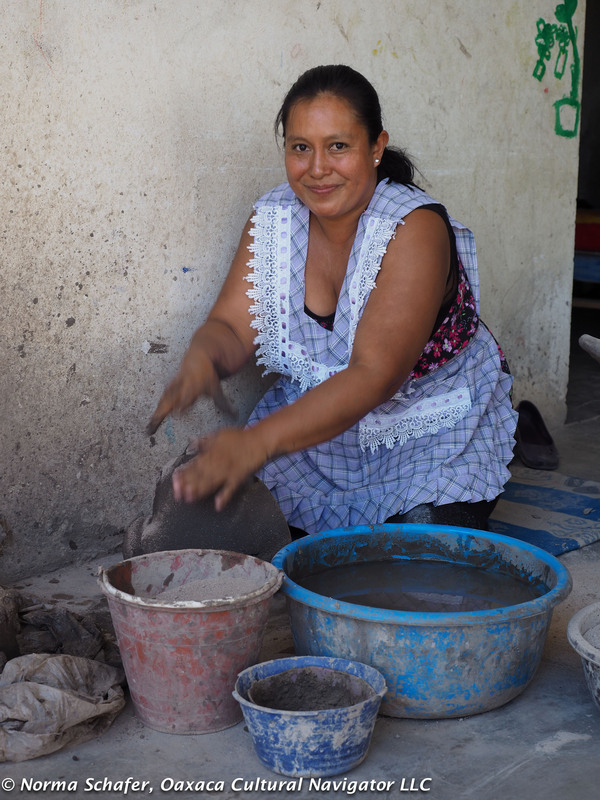 Each one, used for making tortillas or their variation, may last for about two months. Her tools are trees and gourds. 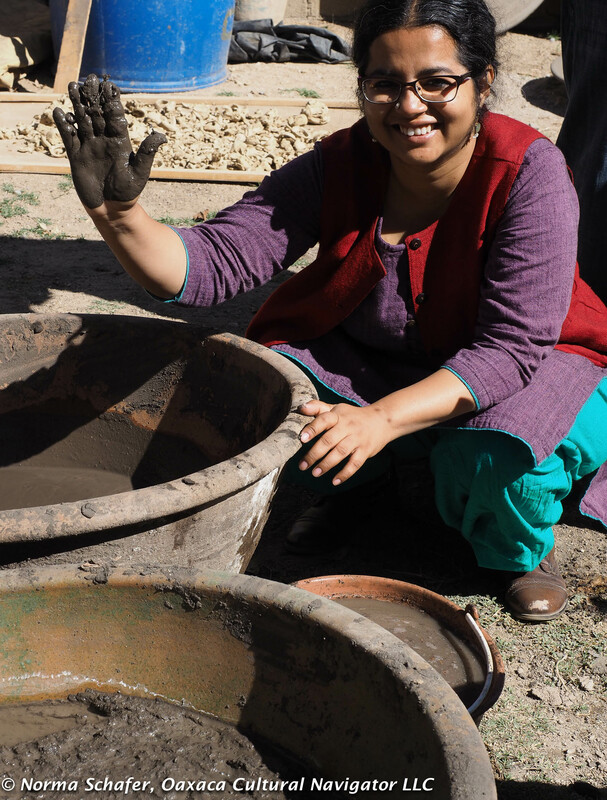 She uses her fingers to feel the thickness of the clay, testing it, determining if she needs to add more to the center for strength. Her children know how to do this, too, now. 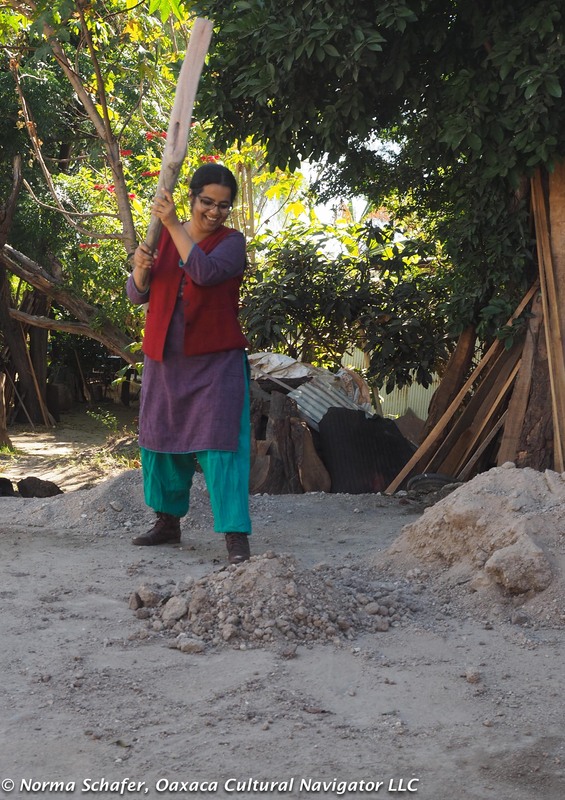 But she dreams that her children will go to university and have a profession. Yet, she also wants them to make ceramics. 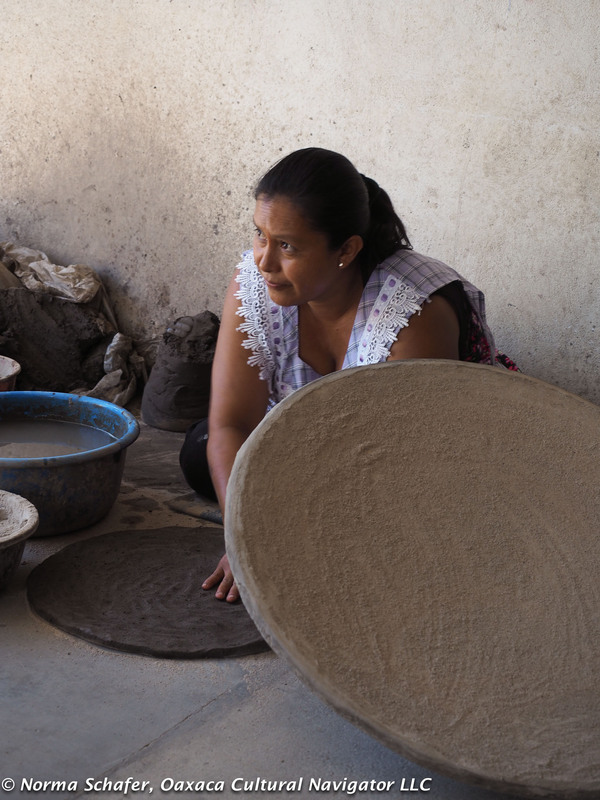 As Francisca pulls and shapes the clay, we watch mesmerized as she forms a beautifully round, perfect comal with lip that is desired by all who work with corn, another artisan craft. The comals will sell for 55 to 70 pesos each. It takes about an hour to make a large one. In the currency exchange rate of pesos to dollars, that’s about $3 to $4.50 each. 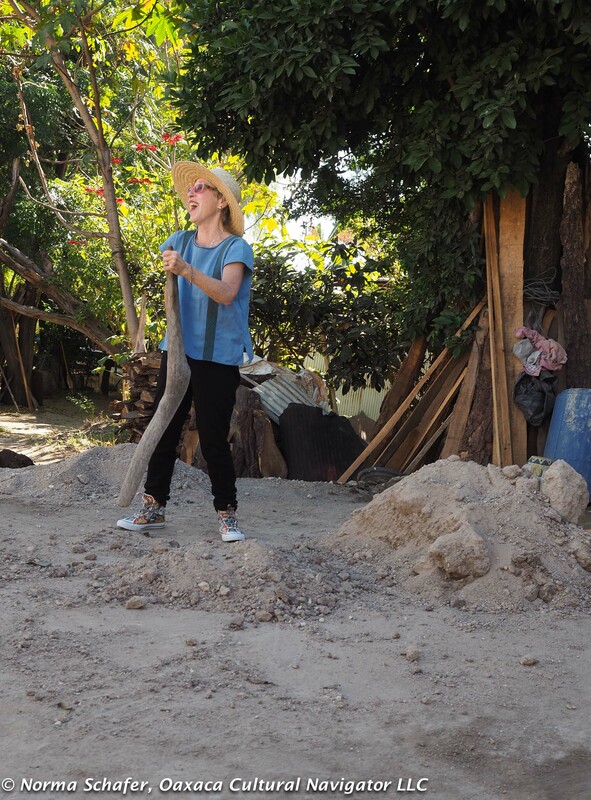 At the rate of eight per day, the gross is $24 to $36 USD per day including labor and materials. When the comal is finished, Guillermo carries it to the sun to dry. 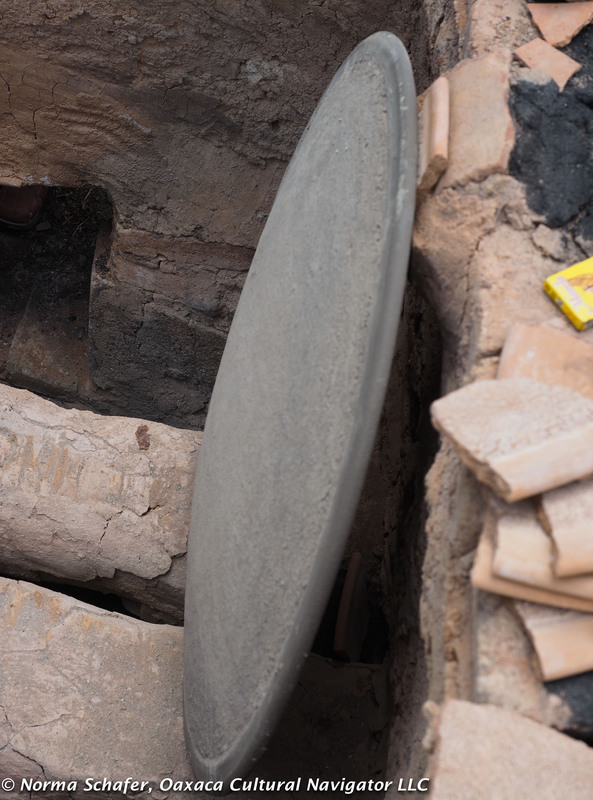 Francisca and Guillermo can fit about 36 comales into the adobe kiln, stacked vertically. The kiln is covered and fueled with wood. After about two hours the temperature reaches a low-fire 900 degrees Fahrenheit. 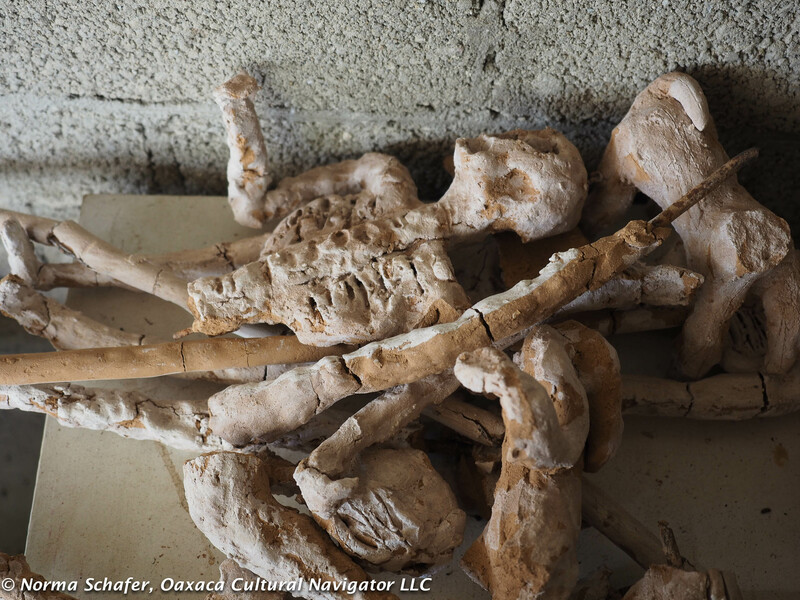 The fire burns out and the clay contents cool, then are removed and prepared to transport to market. 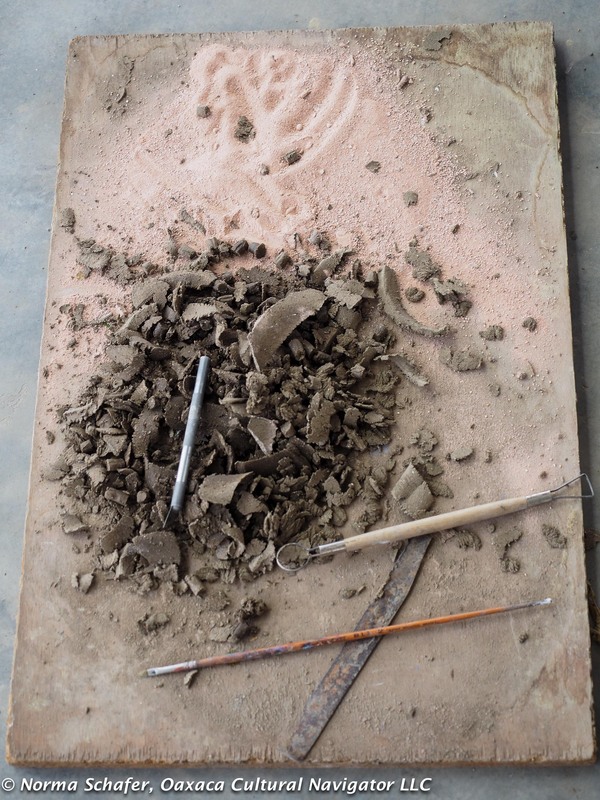 After the demonstration, we took a lump of clay and began to form our own pieces. 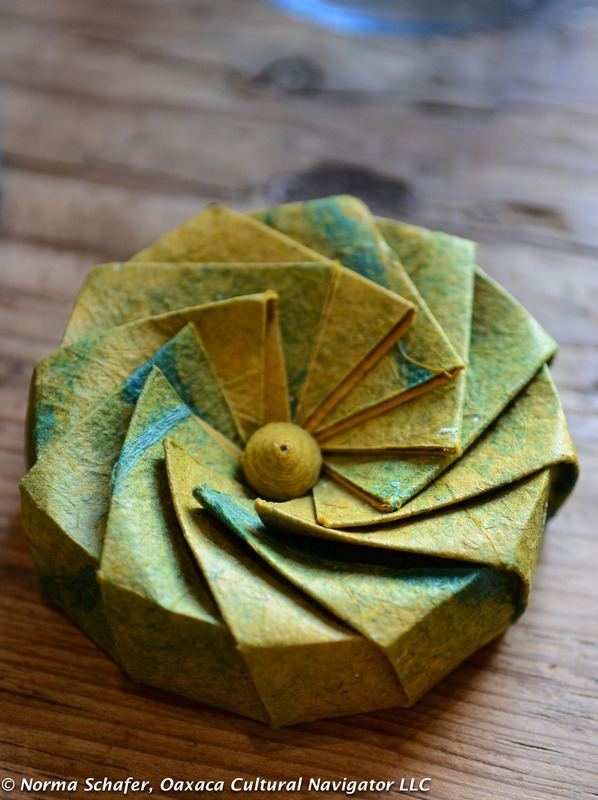 Some of us used a small wheel the size of a plate, balanced on a rock, to turn our work. 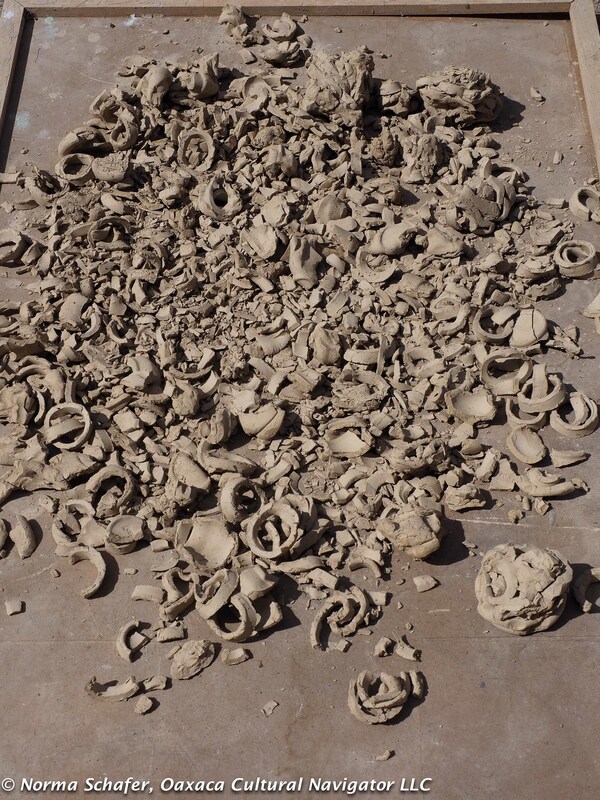 Others shaped the clay using forefinger and thumb or rolling coils and stacking them. The pieces were primitive and imaginative. It was like being a child again! Totally freeform. 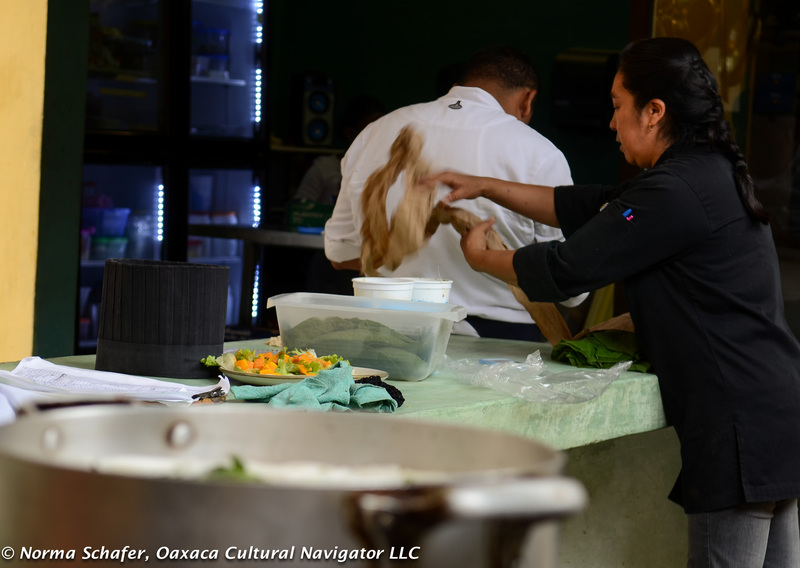 Then, the tables were made ready and Francisca served us a wonderful lunch of sopa de guias, tlayudas and horchata water that she prepared. The family joined us in celebrating the end of a very satisfying day. 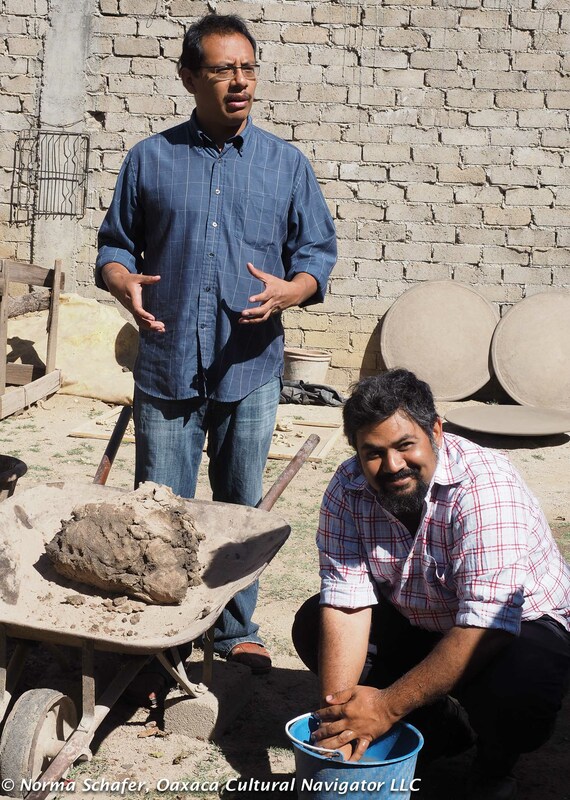 A special thanks to Goyo for translating everything from Spanish to English and giving us great insights into the clay making process. 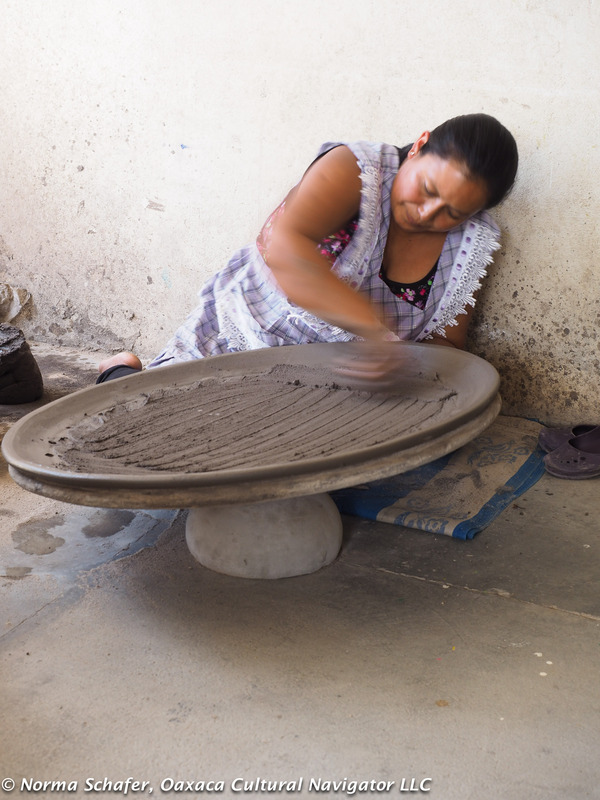 Contact Innovando la Tradicion at the little clay shop 1050 Grados, Rufino Tamayo 800, Oaxaca Centro, phone 951-132-6158 to find out when their next clay tour is scheduled. It’s a wonderful experience. Don’t miss it. 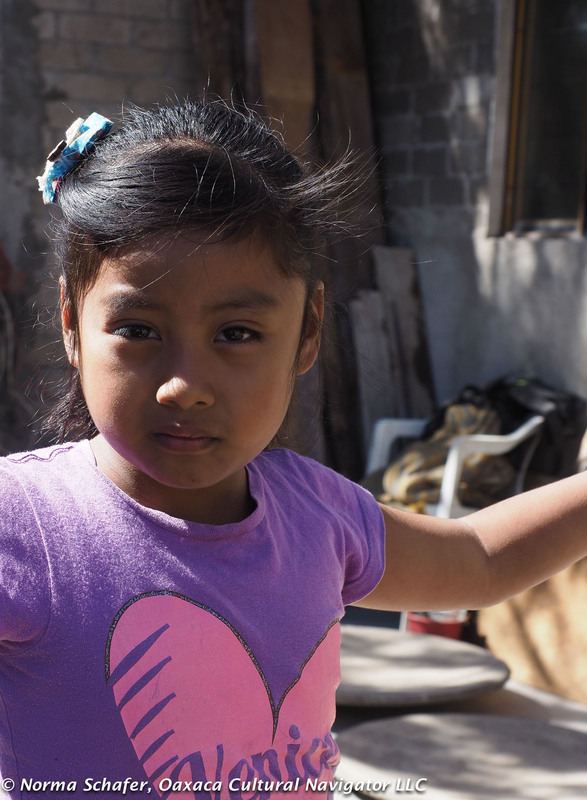 It’s a four-and-a-half hour bus ride from Puebla CAPU to Oaxaca ADO bus station. Taxi from Puebla historic center to CAPU is 80 pesos. Bus ticket is about 450 pesos on ADO GL deluxe service. Easy. Scenic. The road dips and rises through mountains studded with mature saguaro and nopal cactus, flowing river beds (it’s the rainy season) and dramatic gorges. When going south, choose a seat on the right side of the bus. A good time to write, read, lean back and enjoy the ride. 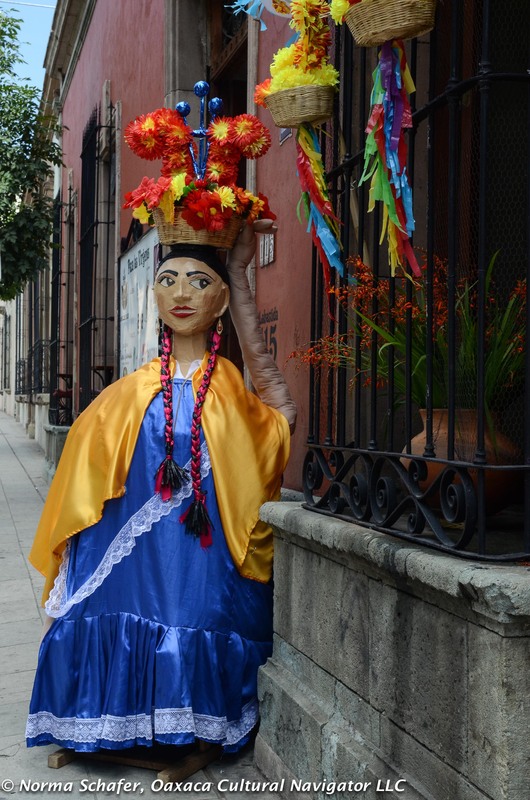 I arrived in Oaxaca on Sunday night, just in time to skip the last Guelaguetza performances on Monday but not the crowds strolling the Andador Macedonio Alcala. 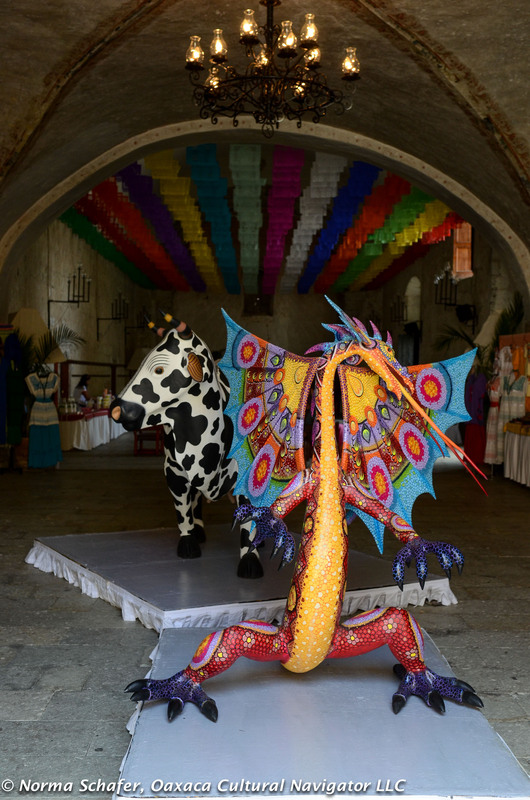 Or, the sounds of the festivities echoing from the Cerro del Fortin pinnacle starting at 10 a.m.
People asked me, are you going to Guelaguetza? 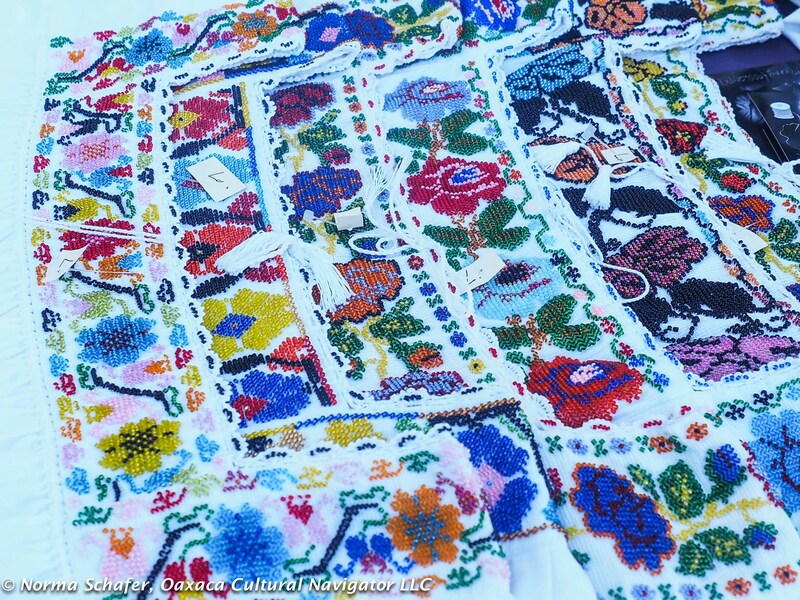 Did you go to Guelaguetza? I told them no. I went for the last two years, had a great time, took lots of photos and decided I didn’t need to repeat the experience for a while. 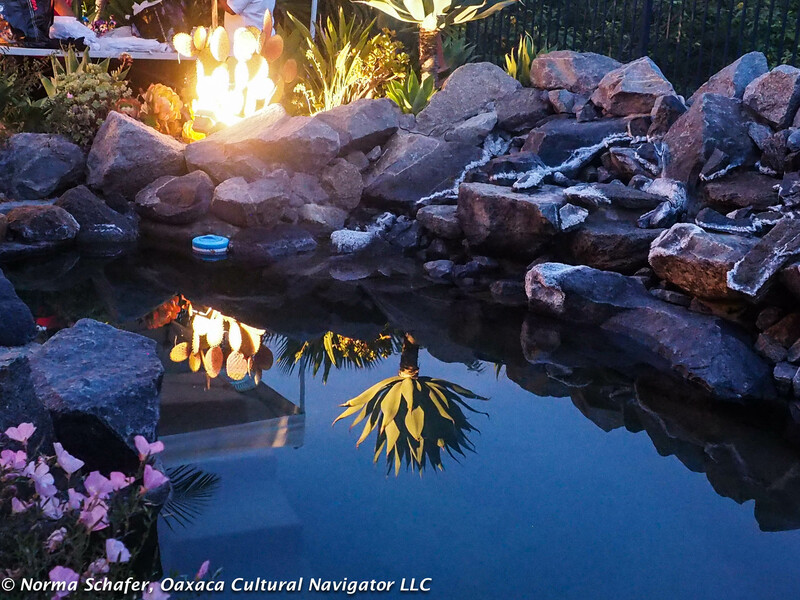 Sunday night, I discovered La Salvadora, a patio bar on Guerrero that serves great artesenal Mexican beer, sandwiches, salads, and usually has live music. A great way to land. Thanks, Hayley. On Monday I walked over 12,000 steps Oaxaca is one of the best walking cities in Mexico with the Andador limited only to pedestrian traffic. 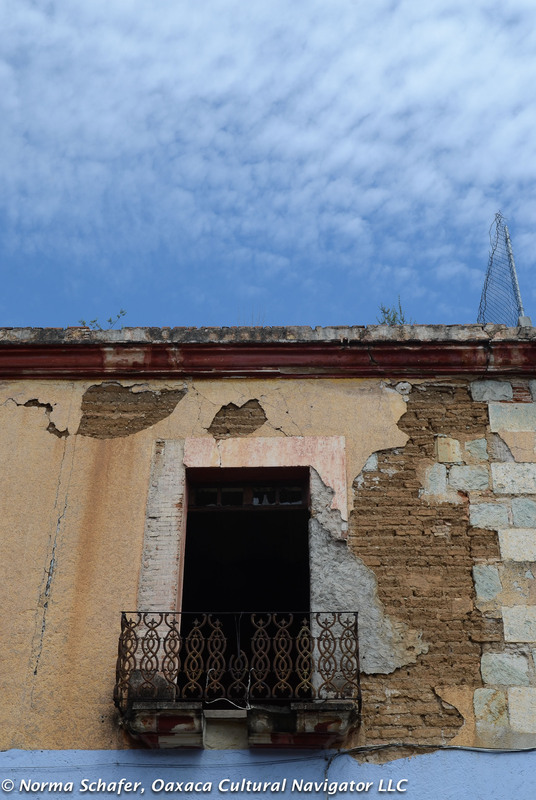 Carol and David invited me to lunch at their departamento under the shadow of Basilica de Soledad on the other side of town, so I walked there, passing colonial adobe buildings in need of renovation. 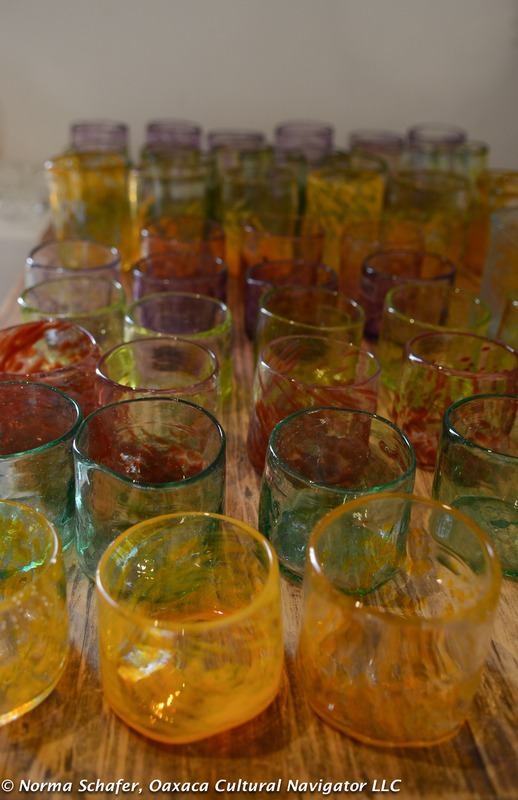 Before that, I walked to ceramic Galeria Tierra Quemada and recycled glass studio Xaquixe to check out mezcal cups that my sister asked me to get for her, and then I went back again as she honed the decision. I finished off the day with a Spanish potato and egg torta (a famed tapas) with organic salad, and a glass of excellent, reasonably priced (40 pesos) red wine at Tastevins on Murguia close to Benito Juarez, with Hayley. This place is becoming a favorite, relaxed, good food, moderately priced. 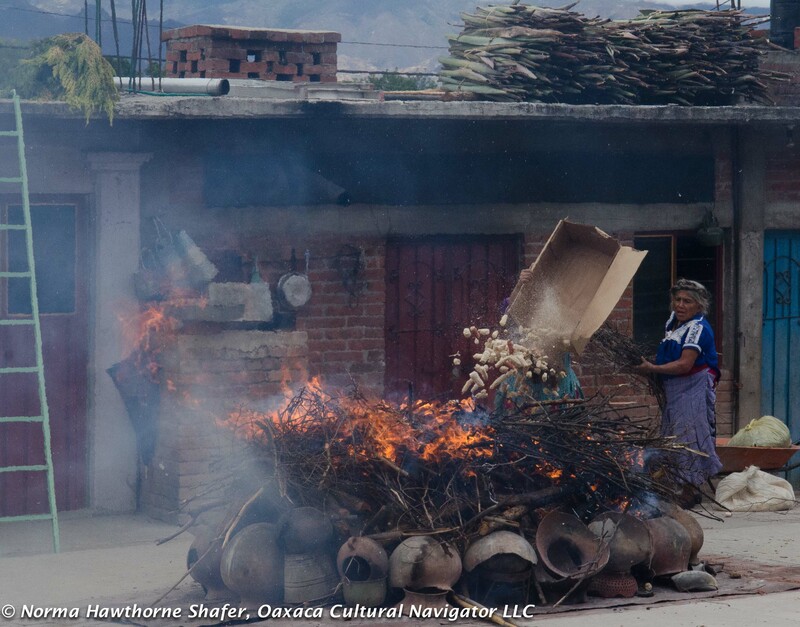 Then, a return trip to Tierra Quemada (meaning burnt earth) for the final order and shipping. And a return to the Xaquixe shop on 5 de Mayo between Abasolo and Constitucion to oggle the handmade paper and glassware once again. After taking care of fingers and toes from all the pavement pounding, I met Martha and Hayley at La Biznaga for a great vegetarian spinach lasagna (Tuesday is vegetarian comida corrida). The portions are so generous, there was enough for lunch today. My good friend and taxista Abraham picked me up late afternoon and I arrived back in Teotitlan del Valle. I don’t have internet connection where I live, so I’m now at my Teoti go-to restaurant Tierra Antigua for reliable service and an excellent horchata. This Saturday Abraham and Rosa are getting married. It’s been in the planning for a year. I’ve known Abraham for about eight years — smart, always reliable, taught himself English, muy dulce — very sweet. He asked me to be the madrina (godmother) of the photography! It’s my gift to them, and I’m excited about participating in all the related activities and then sharing them with you. I have permission!